Here's the Deal: We decided it was time to roll out some major upgrades. The Green Peak Expansion project that added a second peak and 45 additional acres of terrain in 2016/17 was the first major expansion in more than 30 years and the only one of it's kind on the East Coast. Now, we are going even bigger! Phase II of Waterville Valley Resort's development will include the completion of the Green Peak Expansion, plus even more brand new projects throughout the resort. Major improvements will debut this summer, throughout the 2017/18 season, and over the coming years. Progress Update: Check out what we are working on this week. We began at the crack of dawn with perfect weather, and set up crews at the summit and at a landing zone on Valley Run, just above the Sunnyside Timberlodge. Concrete trucks (9 in all) filled 3/4 of a cubic yard of concrete into alternating buckets, called hoppers. The team at Midwest Helicopter Airways Inc. alternated between each hopper, flying one to the summit while the other was being refilled. With more than a hundred trips to pour 80 cubic yards total, it has to be a tight operation and quick turn around, especially with the necessary refueling stops cutting into fly time. Overall our team was able to average less than 4.5 mins per round trip, which is pretty incredible when one sees all of the work involved. The 1958 Sikorsky S-55 kept us on our toes, especially at the summit where a second team was in place to receive the deliveries. Ground and air crews worked in tandem to align the hopper, release and pour the concrete into the footings, and then agitate to remove air and settle for a preliminary cure. With the early preparation of grading and earthwork, setting the footings in place, the heli-pour operation, and the follow-up earthwork to backfill the foundations after curing, our crews have had a lot of long, hard days recently as the ski season fast approaches! This final push of Fall construction on the T-Bar project will allow us to continue installation efforts in the winter months. We are extremely proud of the efforts of our staff and the huge amount of progress that has already been accomplished. What's next? Wait for snow! It's no surprise that we work best with a few feet of the cold stuff under our feet. While weather and temperatures can present their own set of challenges, in other ways we can actually work more effectively in our natural element. It is actually easier and more cost-effective to move large equipment like lift towers over snow using our snowcats and trailers. A substantial snowpack also reduces the environmental impact of ground disturbance during construction. The next few weeks or months will be a waiting game as we monitor the progress of erosion control methods and then wait for mid-winter weather and conditions to develop a nice snowy base to work on. Although some aspects of winter construction are advantageous, you can expect our construction pace to be slower than the sprint of summer we have seen so far due to more demanding conditions and simply being open and operating daily. While our completion timeline will be very much at the mercy of Mother Nature (what else is new?) we are going to do our best to complete this project this winter season. Stay tuned for more details about all the next improvements you can expect to see this season, coming soon! Columbus Day Weekend's Fall Foliage Festival allowed our biggest fans to pick up their Season Passes on Sale and get an exclusive look at the newest innovation to hit our slopes this season. We are happy to announce a new Gateless RFID System. Developed at Waterville Valley Resort by the Affinity team, led by Chris Bradford, it is the first system of it's kind to implement passive RFID technology. No more bar code scanning, and no gates, just direct-to-lift access for less waiting in lines and more skiing and riding. Check out the video of our weekend in Town Square demonstrating our new system to our season passholders. Day Tickets, Season Passes, and even the White Mountain Superpass will all be issued on RFID cards this season. Place your ticket or pass in an unobstructed (not in your wallet), front-facing pocket and ski right onto the lift. It's that simple. Think of it as the high-speed EZ-Pass lane for skiing. Not a passholder? Day tickets will also be issued on RFID cards and will require a $5 deposit. At the end of the day, return your card and get your deposit back or put it toward another purchase. Or even better, keep your card and reload it at home. You will be able to take your own photo, connect your card to your online profile, load purchases, and go direct to the lift on your next visit. The Affinity team is also working on an interactive app to track your stats like number of days skied, amount of vertical, kinds of terrain, and get rewarded! The innovative new system unlocks countless opportunities. This season it will tackle direct-to-lift access to get you skiing faster, but in the future it could help ski patrol find and identify lost or injured skiers, allow you to track your progress and learn, and give you access to every resort amenity without so much as unzipping your jacket. So how does the technology actually work? Since it is still in the development stage, for now the "how" of the new gateless system remains part of Affinity's "secret sauce" and is proprietary. However, stay tuned for more updates about how to use your RFID ticket or pass, what this means for skiing at Waterville Valley, and what else we have planned this season to take us to the Next Level. Two major terrain areas are seeing lift upgrades this summer. Check out our latest update video with some info on what you can expect this season and our next steps. Get a sneak peek behind the scenes this Columbus Day Weekend with a guided mountain hike of new improvements led by Tim Smith, plus demonstrations of some of our new (and never seen before) technology in Town Square. High Country Terrain will see the new T-Bar on skiers left, and the eventual removal of the double chairlift. Forest Service Approval Launches Construction of a New High Country T-Bar Lift! Want to learn more? Stay tuned this week for all the project details, construction updates, and answers to your most pressing questions. Or better yet, get a Sneak Peek during the Columbus Day Weekend Fall Foliage Festival. Tour the new Phase II developments on a guided hike with Tim Smith, attend demonstrations of new technology and equipment in Town Square, and take advantage of the Season Pass Sale, now through October 10th. Plans showing the new ticket windows and deck at the base lodge entrance. It’s Demo Day! Or better yet, demo week for the first stage of the Base Lodge renovation. As a seasonal industry, time and resources are tight to complete development in the summer months but we are plowing ahead on every project on our list, seven days a week, until skis hit snow! However hard we are working this summer, our bucket list is very ambitious and, as is the case for almost all our Phase II projects, renovation and expansion of the base lodge will take place in multiyear stages. This season we will see some immediate changes to the ground floor of the base area that will improve flow, add more amenities, and create a more effective and efficient arrival process. 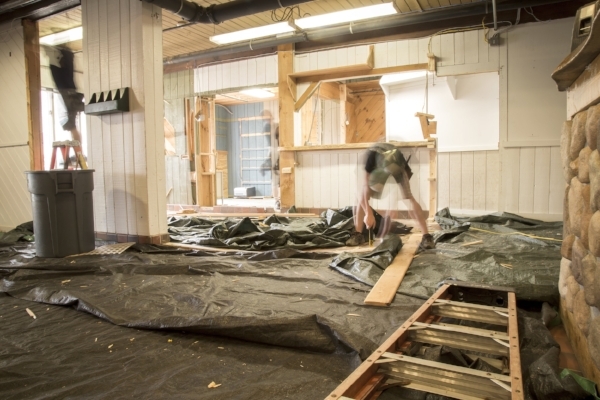 This week we began with the demolition and removal of snowsports office spaces and removed walls and other infrastructure in the original ticket and season pass office. This will create the space we need to relocate the ticket and pass office and the headquarters for the Waterville Valley Adaptive Snowsports Program. This season guests will be able to purchase or pick up tickets and passes from new ticket windows centrally located between the main entry doors and the ski check. By heading inside the main entry doors onto the ground floor, guests will have access to a new ticket and pass office, the snowsports desk, and renovated changing area with new lockers. The relocation of the ticket office not only means more convenience for skiers and riders, it will also make room for the new headquarters of the Adaptive Snowsports program. The original pass office is being converted and expanded, providing more space and resources, better accessibility to the building and parking area, and direct access to the courtyard. We are very excited and proud to have volunteers and athletes of the Adaptive Program involved in the design and construction of the new space, for example, Chris Salomon of Samyn-D’Elia Architects, who is contributing both his professional expertise and Adaptive program volunteer experience. The stairway to the left of the snowsports desk, as well as the second-floor portion of the stairway that leads to Buckets Restaurant will also be removed, remediating congestion and creating more seating and dining space on the second and third floors. Even better, way more window seats with views of the mountain! More space to kick back or refuel will be found on the second-floor deck to the left of the base lodge, which will wrap around to the front of the building over the ski check and new ticket windows, providing more outdoor hangout space. While there is a lot of work being done with just a few months to go until the snow flies, this is just the tip of the iceberg. In the coming years, we will continue renovations that will expand the base lodge and relocate the rental shop, providing a continuous flow from purchasing tickets, to booking lessons, getting geared up, and then heading right onto snow in the new learners area on The Pasture. The expansion will also add more seating and lounge space and windows for spectacular views of the mountain. Stay tuned for progress on this and all our new projects as we start seeing the final stages of this summer’s work and gear up for winter! If you just can’t wait for the snow to fly, be sure to join us Columbus Day Weekend for Foliage Fest in the Valley where we will be debuting some of our new winter developments for the 17/18 season. Goodbye J-Bar, Hello New Lifts! One of the last remaining J-Bars in New England, our Pasture surface lift was removed this week to make room for brand new, state of the art conveyor lifts. Two of them to be precise. While many remember riding J-Bars with a fond sense of nostalgia, for most young and beginner skiers and riders, the J-Bar posed a large barrier to learning the basics. Part of a larger, multi-year project to create a New Learner's Area Experience, the new carpets will not only be more beginner-friendly and speed up loading time, but will also be more energy efficient and a more effective use of staff and the Pasture trail. Next up, the tower foundations need to be chiseled out and removed and then a lot of grading begin this weekend. Because we are installing two carpets, which are surface lifts prone to wear if the trail isn’t perfectly graded, we are going to spend a lot of time getting the earthwork perfect before installation. Finally, the building that housed the base of the lift will be removed to open up that area even more and connect the kinderpark to the rest of the new learning area. 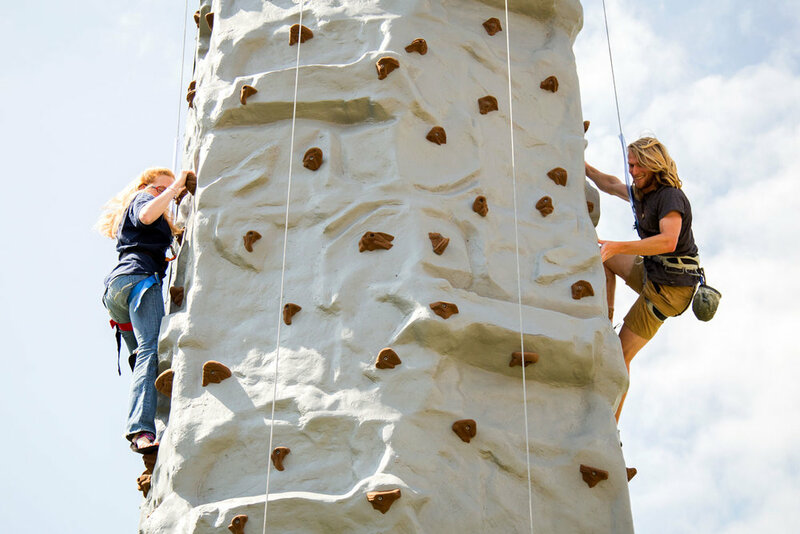 OPENING THIS WEEKEND, 9/2-9/4: New Outdoor Vertical Zone in Town Square! Green Peak Trail Work this Week was a Blast! The video really speaks for itself this week. Sometimes working in the summer is just plain awesome. Especially with so many huge projects going on across the resort. We have been spending a lot of time on Green Peak with blasting finishing up this week on Governors Run to complete grading. The rock drill that helped us set up the blasting zones is also being put to good use for the next few weeks drilling holes for brand new tower snow guns to be installed on Green Peak. Pipe is also continuing to be installed on Green Peak and we are starting to get really excited about winter and the prospect of playing on the product of all this hard work. Many more projects are taking off across the resort but for today, we are all pretty focused on the kaboom! Stay tuned for updates next week on the Base Lodge renovation, more snowmaking details, and lift upgrades! A new fleet of snowmaking guns will debut for the 2017/18 Season! In the marketing department, winter begins Aug 1st! That means we are already on day two of gearing up for snow season and summer construction has already been in full swing for months. While we have been focused on debuting new summer activities, up the hill, our crews have been working nonstop, seven days a week, to get snowmaking pipe in the ground. Mountain Ops Director, Barry St. Cyr estimates we are about 60% finished with Chandler’s Way and as you can see in the video, are done with a large portion of welding and have moved the 6” water pipe in gigantic segments to the summit. The sound that these 40+ foot segments of pipe make as they travel over the rocky terrain is straight out of a galactic battle scene. We are also about halfway done with laying 8” water lines at the bottom of Governors Run. A lot more progress will be made when blasting is complete, which will begin in the next week or so. Blasting entails using rock drills to make holes that will then be filled with dynamite and covered with big rubber mats (think flattened truck tires) before the kaboom. At the same time, we will be drilling post holes for tower guns. In total, we will lay 36,000ft of snowmaking pipe and are spending more than $1.15 million on a new fleet of low energy, high efficiency snowmaking guns, fans, and other equipment to outfit Green Peak and upgrade the Mt. Tecumseh snowmaking system. To say we are gearing up for winter is an understatement. As always, stay tuned for more weekly updates and videos coming up, including an opening day announcement for the Bungee Trampoline and Climbing Tower in Town Square, and hopefully some explosive footage of blasting on Green Peak! Courtney, from Group Sales, helps Adventure Center Staff train on the new climbing wall. ResortBoard Adventure Tours and the Snow's Mountain Disc Golf Course are NOW OPEN! The Climbing Wall and Bungee Trampoline are on site and require a few weeks of training before they will be installed in the "Vertical Zone" in Town Square. Training days are definitely one of the more fun perks of being an employee! (P.S. That could be you! We are hiring for Adventure Center Staff!) Head over to the Adventure Center Page for more info, pricing, hours, and details. In other Phase II news, crews have been working tirelessly on Green Peak. After completing weeks of welding, we are laying pipe on Chandler's Way and the excavator is officially done on Clean Shaven, making for our first completed black diamond trail! After some feedback last season we are also doing some work to improve the Green Peak unload area. Staff temporarily set up and trained on the new Outdoor Climbing Wall. Laying out the Disc Golf Course on Snow's Mountain. All New Summer Amenities Have Arrived! The last week has been a blast as we have been breaking in the new ResortBoards and laying out the tour route. This week the other new summer activities have arrived on site! The climbing wall and bungee trampoline have arrived and yesterday staff set up and trained in a temporary location. Next steps involve installation in Town Square and further training before operations for the public begin. Disc Golf equipment and supplies also arrived this week after a few weeks of laying out the course and additional trail maintenance. Today, the baskets and signage will begin being installed on Snow's Mountain. ResortBoard Adventure Tours begin this weekend, July 22nd & 23rd! 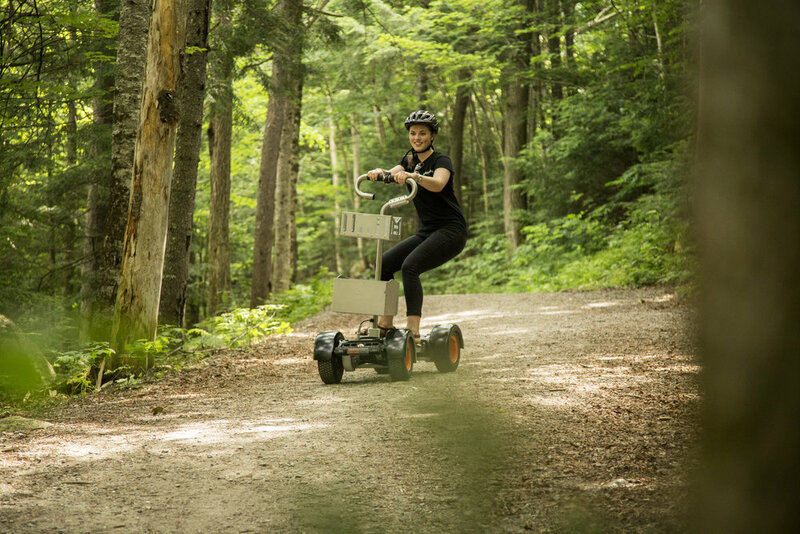 Reservations are required so be sure to call the Adventure Center at (603) 236-4666 to book your tour now! As always, stay tuned for more updates and opening day announcements for the Climbing Wall and Bungee Trampoline and our new 9-Hole Disc Golf Course! Whitney takes a ResortBoard off road on the Village Trail. Matt practices in the learning area, adjacent to Town Square and the Adventure Center. New Summer Activities Set to Debut as Soon as Next Week! While most of the Phase II projects will bring excitement to skiers and riders come winter, one project seeks to expand summer offerings in the Valley and in Town Square, and it’s almost ready to debut! We have been working hard this spring and were fortunate that a lot of logistics fell into place quickly. That means we can hit the ground with multiple brand new summer activities set to begin their debuts as soon as next week! The ResortBoards are already on site and staff had a blast with their first day of training today! The Adventure Center will begin offering guided ResortBoard Adventure Tours next weekend. Call the Adventure Center at (603) 236-4666 to reserve your spot for a 10:00am or 2:00pm tour on Saturday, July 22nd or Sunday, July 23rd. Tours are $48 per person, space is limited, and reservations are required. More information, the regular tour schedule, and pricing will be available on our website next week! The opening of the 9-Hole Disc Golf Course on Snow’s Mountain is also fast approaching. The course has been laid out and terrain maintenance is underway this week with the goal of installing equipment and signage next week. The final piece of our new summer activity trio will be an outdoor climbing wall and bungee trampoline located right in Town Square! We are still a few weeks out on debuting this major addition so we will keep posting updates as we make progress. Seeding trails on Green Peak. Hay prevents erosion and aids in seed germination. Erosion Control and Trail Grading Makes Progress on Green Peak. Our team has wrapped up grading and erosion control work on Governors Run, save for a few small areas that require additional blasting, which will begin in the next few weeks. We have now moved down to Bourbon Street and Lower Stillness to continue excavation, grading, and seeding trails. Seeding trails helps establish a root base and prevents erosion, which is especially important after last weekend's major rain event. After trails are seeded, we lay down hay which creates a greenhouse effect, helping seeds germinate, as well as slowing down water and acting as temporary erosion prevention until the root system develops. Our snowmakers have been finishing up welding pipe up on the hill and will be ready to start putting it into place pretty soon. Off the slopes, we are already seeing the fruits of Phase II projects begin to drop! We are going to start seeing new summer amenities arriving on property this week! Rain or shine, our crews are out there today working hard on the new Green Peak Snowmaking System. Over the past few weeks 40ft sections of 4" airline pipe have been welded together in groups of three. Today the new 120ft long segments are being moved by a massive loader, slowly and carefully, to the Green Peak summit via access roads. Once there, crews will begin assembling, welding, and installing this pipe on Chandler's Way. The 6" water lines have already been installed on the Oblivion trail and across Upper Valley Run to connect the Green Peak system to the existing Mt. Tecumseh infrastructure. As installation has progressed over the last few weeks production (measured in feet of pipe installed per day) has been speeding up as our crews get into the rhythm of construction. On the other side of Green Peak excavation work has been making a major dent in Governors Run trail clearing and grading. Crew's have been making their way uphill and are almost at the summit, with a quick detour to the Jugtown jug handle coming up soon. Learn more about the significant meanings behind the Green Peak Trail Names. Waterville Valley Resort, June 14, 2017—Waterville Valley Resort announced that it has secured funding to begin work on Phase II of its $7.5 million capital improvements plan that began with the Green Peak Expansion in Fall 2016. Phase II of this capital investment program will bring multi-year infrastructure upgrades and improvements throughout the resort. “This is the second step in the most exciting revitalization of Waterville Valley Resort in over 30 years. We are proud to be the only mountain on the East Coast pursuing a renovation of this magnitude” says John H. Sununu, Waterville Valley Resort CEO and Chairman. The Green Peak Expansion project added a second peak and 45 additional acres of terrain in 2016/17. Phase II of development will include new projects throughout the resort, as well as the completion of the Green Peak Expansion. Work will include additional Green Peak trail clearing and installation of a new snowmaking system, upgrades to existing snowmaking infrastructure on Mount Tecumseh, multiple lift enhancements, base lodge renovations, a new beginner area experience, nordic trail system improvements, and additional summer offerings. In anticipation of the major enhancements set to debut throughout the 2017/18 Season, a 10-day Seasonal Pass Flash Sale ending on Friday, June 23rd will offer the lowest pricing of the year on seasonal products for one last time. Waterville Valley Resort is expected to release further details of the multi-year project as progress continues.